Learn from coaches that have played futsal! Everson Maciel will be directing all programs. BRAZIL CT is proud to announce our winter futsal program for the 2018/19 season! Our main goal with this program is to keep developing players' skills through the game of Futsal. Futsal is a quick style of soccer popular in Brazil and in Europe. The essence of the Brazilian style is the efficiency with split-second improvisation, creativity, and technique. Played on a small, indoor court with a smaller, heavier ball, our program emphasizes ball control and precise passing. THIS PROGRAM WILL MAKE SOCCER PLAYERS FAST... VERY FAST! BRAZIL CT designs its futsal programs by targeting players of all levels. We create a learning environment that focuses on building skills, confidence and encouraging creativity while enhancing a player's passion for the game. The priority of our Futsal programs is to work on players' individual skills that coaches are not able to teach during team practices. We want each player to leave our futsal programs with a soccer experience of a lifetime! All programs have high qualified futsal coaches! Cinics are recomended for soccer and futsal players who want to improve their skills during the winter months. Clinics are offered throughout Connecticut for players of all skill levels who want to develop their footskills, quick thinking and tecchnique within a small team environment. Samba Futsal Local Teams are individual and team players registered on our clinics who are interested in competing in local tournaments, teams will be formed during clinic training sessions with players of the same ability. This is the first developmental step for players to enjoy, learn, and compete playing Futsal. Already have a team? Email or call us. 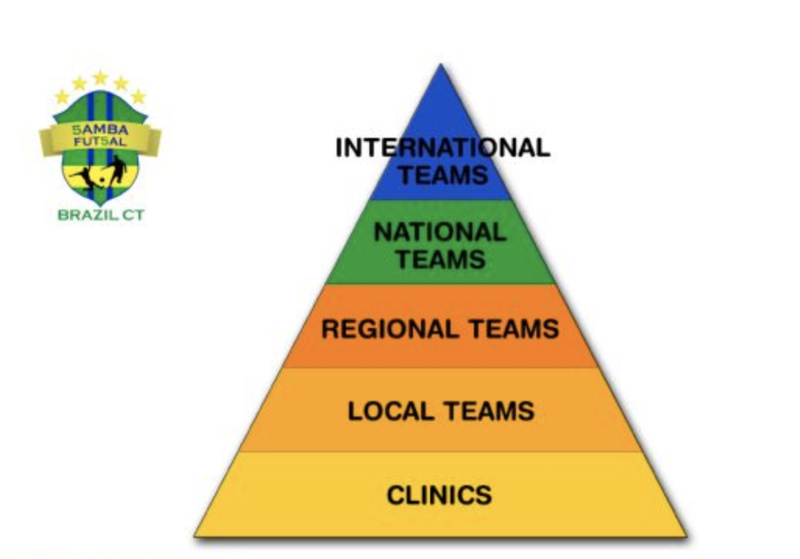 Samba Futsal Regional Teams is designed for players to train within a small team environment and to compete regionally at the highest level. Teams that do well in the region could compete on the national level during the summer months. Samba Futsal National Teams is for teams that do well at the regional level and are willing to compete on a national level during the summer months. Teams will be able to compete in national tournaments in Florida and/or California. Samba Futsal International Teams is for National Teams who will also have a chance to compete Internationally. Our club will have a chance to participate in top futsal tournaments in Spain, Italy and Brazil. Coach Everson's long time friend and futsal partner Marcio Forte, former Italian National futsal player and team captain, currently Pescara (Italian professional futsal team) head coach will be our International Advisor for tournaments in Europe and Brazil.